For the first time, fans of the cutest kitty on the planet will have the opportunity to own Hello Kitty merchandises that have been exclusively designed for Guardian Malaysia. The items will be available at Guardian stores starting 1st February. Guardian Health and Beauty Sdn Bhd and Hello Kitty have teamed up again to bring smiles to fans, the young and the young-at-heart throughout the country. For the first time, fans of the cutest kitty on the planet will have the opportunity to own nine items that have been exclusively designed for Guardian Malaysia. He said: “The two collections have been designed to celebrate the Chinese New Year season, and International Women’s Day which falls on 8 March. As such, these items are being rolled out in two phases, each with its own set of items. 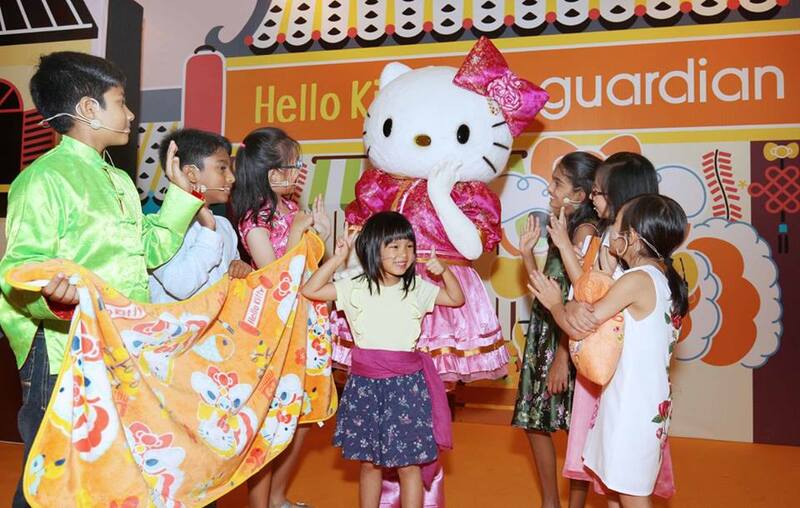 The children striking a pose with the world's most lovable kitty, Hello Kitty at the launch of Guardian's Hello Kitty collection. The “Hello Kitty Celebrates” range, comprising blankets, cushions and notebook and bookmark and designed to reflect the celebrative mood, will be available at Guardian stores from 1 February to 7 March. The other collection “Hello Kitty Hello Confidence”, comprising a tote bag, lunch bags, cosmetics pouch and laptop bag, comes in purple and pink and carry messages of “love”, “cheer” and “spread love” to symbolise International Women’s Day. They will be in the stores from 8 March to 18 April. 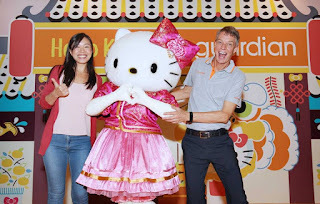 CEO of Guardian Health and Beauty Sdn Bhd, Mr. Soren Lauridsen (right) and Senior Marketing Manager, Shirley New (left) striking a pose with the cutest kitty on the planet. 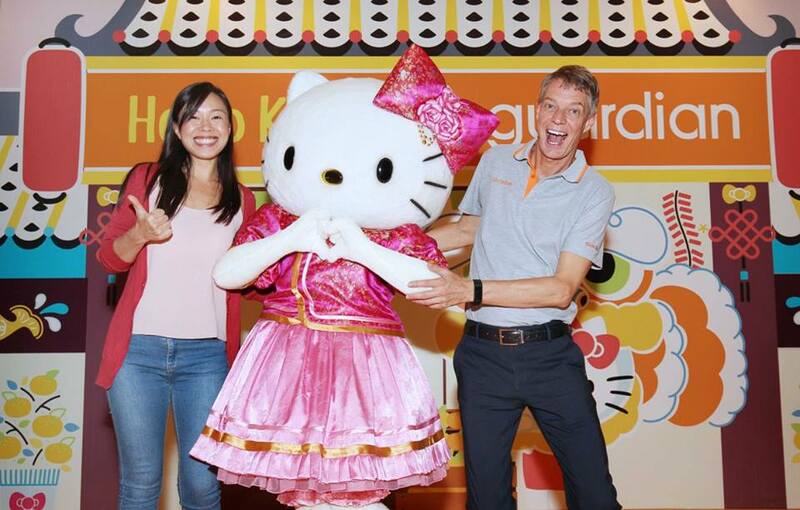 Hello Kitty, which has been inspiring millions of fans all over the world, including a huge fan base in Malaysia has set up its own Hello Kitty Town in Puteri Harbour in Johore. 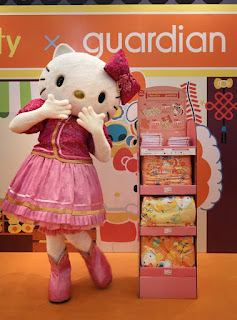 Guardian Malaysia, in conjunction with launch of these collections, will be offering customers in Johore an opportunity to tour Hello Kitty Town and to meet Hello Kitty. Customers making purchases of RM150.00, inclusive of any Hello Kitty Celebrates merchandise, at selected Guardian stores, will stand a chance to be receive two complimentary tickets to Hello Kitty Town. Limited tickets available. include one item from a sponsor brand; or RM30, without a sponsor brand. So head on down to your local Guardian store and start building your collection! 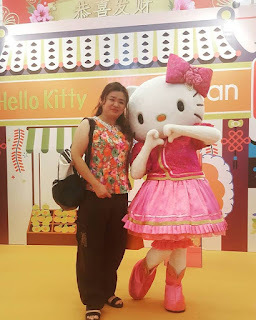 Happy me as I get went to Berjaya Time Square last Saturday and waited for the photo session with Hello Kitty at 1.15pm. Thanks to Guardian Malaysia for inviting me and my dear for helping me to fetch son from school so that I can attend this wonderful event.